The story of Ezekiel is perhaps one of the most fascinating stories found in the Bible, especially if you look at the story from a modern, technological point of view. When ancient texts, legends, and stories are viewed and interpreted through modern eyes, we start to understand that Earth’s ancient past is far more exciting and mysterious then we’ve ever imagined. When one’s personal view is not bound by strict belief’s set forth by modern scholars, you become aware of the fact that our ancestors were trying to tell us something. It’s not a secret that there are millions of people around the globe who are convinced that thousands of years ago, ancient mankind was visited by beings, not from Earth. By interpreting our ancient history through modern eyes, and without predispositions, we come to the possibility that our ancient ancestors may have been visited by an advanced race of alien beings, rather than Gods. And one such visitation is excellently described in the Bible: Ezekiel’s story. 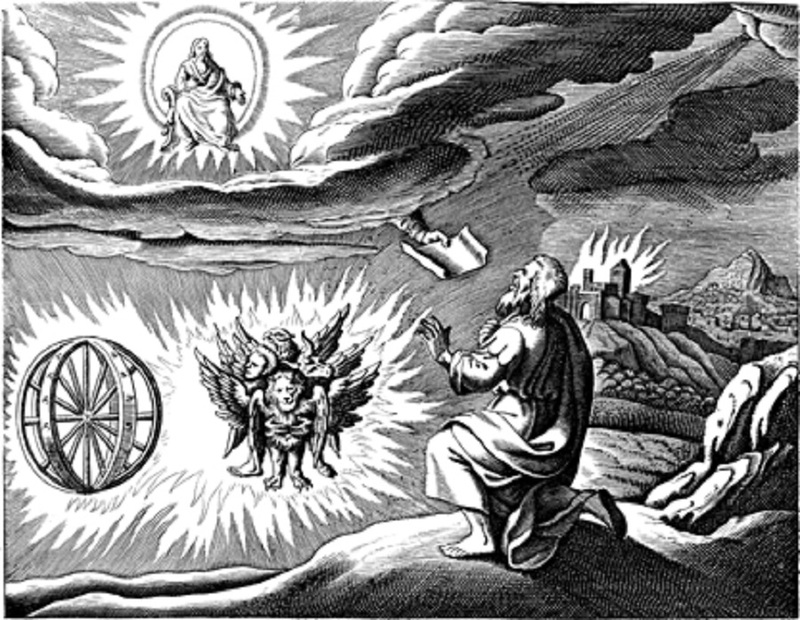 Ezekiel’s vision of the Merkabah, the so-called wheeled chariot gives a lot of room for interpretation. Rather than a wheeled chariot, many ancient astronaut theorists argue that the Merkabah may have been a spaceship or some sort of space shuttle that landed on Earth in the distant past. One of the most famous authors supporting this idea is Erich Von Daniken, who has provided compelling evidence through his research which points to an alternative explanation/interpretation of the Book of Ezekiel and what Ezekiel may have witnessed in the past. In fact, Von Daniken’s theory was so astounding, that it woke the interest of a NASA scientist who decided to disprove Von Daniken’s theory. In Von Daniken’s book Chariot of the Gods, the Swiss author set forth the idea that Ezekiel’s vision was that of a space shuttle, and not a divine chariot. This idea led Josef F. Blumrich to try and disprove Von Daniken’s theory. However, the more Blumirch researched, the less he was convinced he could disprove Von Daniken’s theory. Eventually, he started writing a book. Blumrich soon realized, through his research, that Ezekiel may have been describing a Spaceship landing on Earth, and not just a heavenly chariot. In fact, Blumrich was so convinced that he patented his very own version of an omnidirectional wheel. The most important thing here worth mentioning is the fact that Blumrich realized on his own, through his own research that the description present in the bible possibly is that of a spaceship. In the book of Ezekiel, an ancient work of literature which is among the very first works written in a first-person account—unlike other books which were written in the third person—Ezekiel describes seeing a wheeled chariot come toward him descending from the sky. What does that mean? It means they weren’t humans, but they may have been humanoid in nature, explain ancient astronaut theorists. Furthermore, Ezekiel describes the ‘chariot’ landing, and it sounds pretty much like the description of a spaceship landing. Was Ezekiel Describing Four beings Of Different “Races” thad had a human like features ( two arms, two legs and a head? A Group of extraterrestrial in wich one looked like a lion, one like a human, one like an ox and one like an eagle ? No matter what, you can’t deny that the description by Ezekiel sounds pretty familiar to how we would describe modern-day spaceships lifting off and landing on Earth.